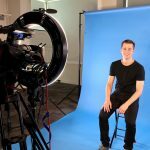 Figure Skaters Online launched Grant Hochstein‘s official website back in the summer of 2009, right before his ISU Junior Grand Prix debut and first senior national season. 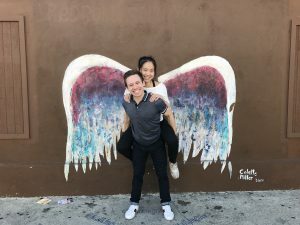 He turned 28 last month, and he and his fiancée, Caroline Zhang, are in the midst of finalizing plans for their upcoming wedding while maintaining busy coaching schedules. On August 3, 2018, U.S. Figure Skating published a press release [click here to read] announcing Grant’s retirement from competition. 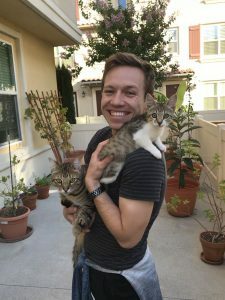 Recently, Figure Skaters Online conducted an interview with Grant via e-mail on topics ranging from his skating career memories, current coaching life, upcoming wedding, and expanding pet family. FSO: Would you like to share some news with your fans? GH: Yes, I would like to announce an official retirement. I’ve been skating for almost twenty years and competing internationally for eleven. I’ve met so many wonderful people, traveled to incredible places all across the world and learned a lot about myself. Skating has been more than just a sport; it has shaped me into who I am as a person. I have loved training, learning, working and competing. It will be hard letting go, but I’m staying involved in the sport through coaching, so it isn’t really the end for me. I feel like I have learned so much and now is the time for me to share my knowledge and experience with others. FSO: What are some of the memorable personal highlights in your skating career? GH: This is actually a really tough question to answer because there have been so many highlights … and a lot of low moments too! I think if I had to rank some of my best and most memorable moments in skating I would have to choose three. 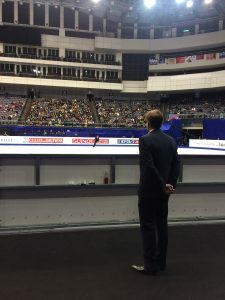 Peter Oppegard watching Grant from the boards at the 2018 Four Continents Championships. 1.) My free skate at the 2018 Four Continents Championships. It was my final skate of my life and I had really been struggling all week long. It was an odd situation being an alternate for that event. After not being initially assigned, I thought it was the end for me. I stopped skating and started eating! I took my first retirement really to heart…and stomach. I had a little over a week and a half to prepare for the competition and nothing really seemed to be easy. My short program was a disaster and I found myself in 15th place. 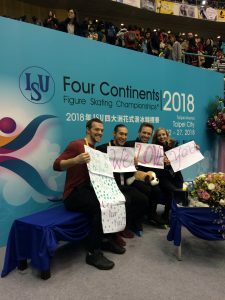 Grant with Danny O’Shea, Jason Brown and Tarah Kayne in the Kiss and Cry at the 2018 Four Continents Championships. Going into the long I told myself that this was it and no matter what or how it went, I had to enjoy every moment of the program. I went out and things just clicked. I skated a clean program, one of the best of my life, and the feeling I had when I finished was utter relief. I wanted so much to finish my career on a high note and leave the ice feeling complete and that is exactly what I did. I made sure to take a final look before I got off the ice, bowed to the audience at the door, turned and bowed to Peter [Oppegard] and took my last step off of competitive ice. 2.) 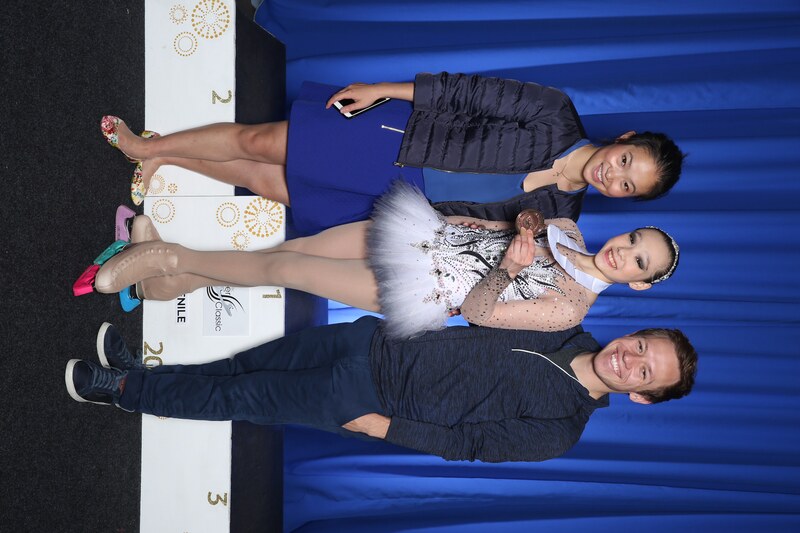 My second greatest highlight of my career was my short program at the 2018 U.S. Championships. I’ve never really been much of a short program skater. I like the long a lot better, so that’s why this one is special. Again, going into the competition knowing that this could be my final short program was a really emotional thing. I’m not going to lie, I got a little teary-eyed backstage before the warm up. 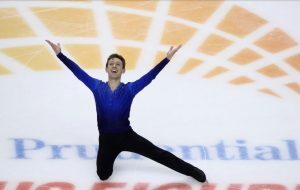 Grant’s short program ending pose at 2018 Nationals. It was another instance where things just clicked exactly as they should and I rode that wave through the program. When I finished I was so happy because in my last short program at Nationals I had FINALLY skated the clean program. I had been waiting for it my entire life and there it was! I didn’t care about placement or results and I didn’t go into that Nationals thinking about the Olympics. I went into it thinking about how much I loved skating and how this would be the culmination of years of hard work. I had my moment and I was at peace. 3.) I would say that my ultimate career highlight took place in my long program at the 2016 World Championships in Boston. If we are being honest, I don’t even know where to begin. It was such an honor to be at worlds and in my home country nonetheless. All of the people who meant the most to me in my life were there for that free skate and I went out and delivered the skate of my life. It was not an easy program to skate. None of my elements felt easy, but I was so trained that I wasn’t going to let anything stop me. My “Les Mis” program is my favorite program that I’ve ever had and as the program built, the audience rose with me. I’m usually very focused and unaware of what’s happening around me, but I could hear people shouting encouragements to me from about the halfway point until the end. It was strange being so focused, yet so aware of what was happening around me. By the time I hit my final jumping pass, the audience was so loud that I couldn’t even hear my music. I don’t think many skaters get to experience things like that and it happened to me. I had such a feeling of joy when I finished and I think it’s partially because before that year I had gotten to a point where Worlds never seemed like an option to me anymore. I had sort of plateaued and then, all of a sudden in one year, everything I had wanted in my career had happened. I finish in the top four at two Grand Prix events, medaled at my first senior nationals and then finished in the top 10 at worlds. I have been blessed so much through my career and these are just a few of the incredible moments I’ve gotten to share with all of you. FSO: You mentioned “low moments.” Can you share examples of a few such moments (“lowlights”) that you’ve overcome through so many years of competition? GH: The lowlights are always incredible frustrating, but I think they help us build our character. Like I said earlier, before the 2015-16 season I wasn’t sure if I was going to keep skating. The sport is expensive and I wasn’t advancing much anymore so I figured I would give it one last push. So to anyone reading this who feels like they can’t do it anymore, don’t listen to that negative voice in your head. Listen to your heart. I still loved skating and deep down with a lot of heart and hard work and just a little bit of luck, your whole life can turn around. For me, the fall is generally a time of lowlights! For some reason, summer usually goes pretty well, I take a dip in the fall and then peak around Nationals and Four Continents. My friends and I joke that I’m the “Pewter Prince” because of the ridiculous number of times I’ve finished in fourth place. That can get a bit frustrating. Internationally I’ve been 4th eight times which would be great if fourth place got a medal internationally. I’ve also been 4th at Nationals four times, so at least there’s a medal involved there. Things like that can get frustrating, but you have to remember why you are skating. Medals are great, but if that’s all you’re skating for, it will be an empty existence and you will leave the sport feeling bitter. I feel complete in my journey because it’s about so much more than just results. FSO: What are your immediate post-skating plans? GH: Currently, I spend most of my day at the rink teaching. People wonder what I’m doing now that I’m retired and it’s funny because I spend more time than ever in an ice rink. I really love teaching. I feel like I’ve learned so much and had so many unique experiences over the years that I can really give back to the kids and help guide them through their own careers. FSO: Give us a sense of your current Monday-Friday teaching schedule at the rink now that you’re no longer training yourself. GH: Right now I’m teaching basically all day. Summer is chaotic because there are always kids in from out of town, but right now we are pulling 12+ hour days at the rink. It’s exhausting, but I love it. 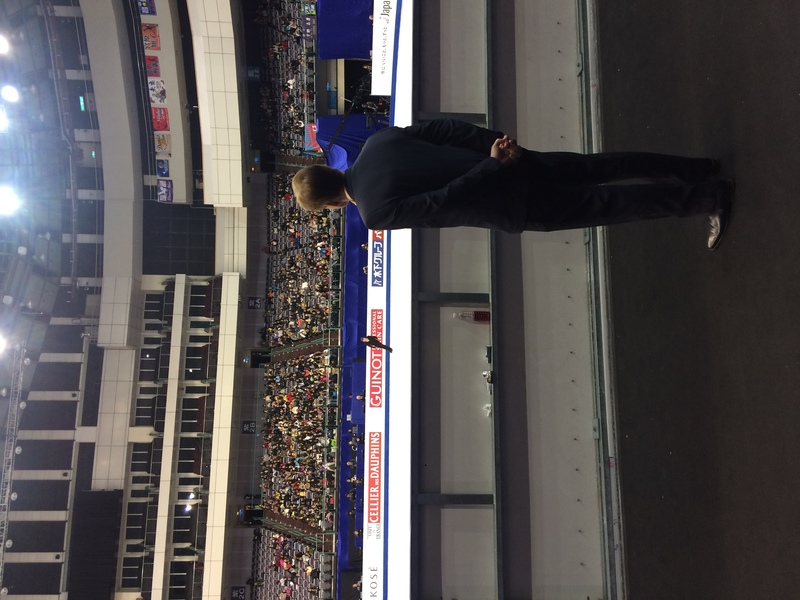 FSO: Can you describe your approach in choreographing programs for your competitive skaters. Do you still split choreography duties with Caroline [Zhang]? GH: This is a great question because we are so different. Caroline comes in with a plan. She choreographs ahead of time at home. She sits down and plans it all out, but for me, it works better if I just go with the flow. I’m definitely a more feeling-based choreographer and it works better for me like that. We also hear music differently. She has more musical talent in terms of playing the violin or piano. She doesn’t need to read music. If she hears something she can just figure out how to play it. Since I am lacking in that area, I go based more on the emotion I’m trying to give, rather than the physical music. 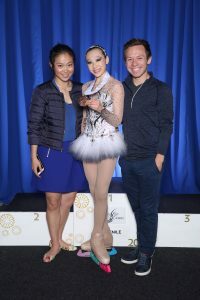 Grant and Caroline with their student, Cassidy, after she won a medal at a recent club competition. FSO: Would you like to elaborate on how you and Caroline function as a coaching team and your individual roles? GH: For most of our shared students, I am the acting primary coach. I do the jump work, run programs, and break down the technique. Caroline is supplementary in that role too, because she helps and serves as a great backup for those things. She, herself, does the spin lessons. She is so talented and comes up with these ideas and thoughts on spins that I’ve never heard before and they work incredibly well. She also does a lot of detail work which makes me life a lot easier. Our strengths and weaknesses really are balanced with one another. FSO: What are some of the effective methods you use to teach “clean skating skills” and “basics” to young skaters and yet make it fun for them? GH: I think my ideas have developed, but not changed. The basics are incredibly important, but I think it is important to be able to learn basics and still the challenging new tricks. We work on learning simple crossover exercises, but using difficult turns to connect them. Instead of plain spirals we can work on change edge spirals to make it more interesting. How many Axels can we do in a row? Who can hold their combination spin the longest while only changing their foot once? And, last but not least, who can out jump Mr. Grant while he is skating the other [counterclockwise for him] direction? That’s a fan favorite! FSO: Are you planning to resume/finish your college degree? GH: Finishing my college degree is something that is really important to me. I think most people assume that I graduated because I was going full-time for four years [at Wayne State University in Michigan], but I still have about a year to go. I transferred schools and am currently enrolled at National University, which is an online university. With my busy work schedule there would be no way for my to go to classes and have a normal, functioning life, so online has been a great option. I take one class a month and have finished two so far with about twelve to go. I’m taking two months off during the summer because my teaching schedule is so busy in the summer and we have all of our wedding planning ahead of us, but I should be back in class in September to finish my History degree. FSO: So how is your wedding planning with Caroline going and do you want tell share any specifics at this time? GH: Our wedding is coming up so fast! Planning the wedding has taken up a fair chunk of my time. There are so many little details that you never think about that have to be decided upon. I’m sort of a control freak, so even though we have a wedding planner, I still feel like I need to be involved in all of the details. I’m not going to share any specifics right now except to say that it will be held on August 18th in Los Angeles at a beautiful Catholic Church. It’s a really intimate wedding which was something we both firmly agreed upon. We know so many people that things could have gotten out of control, but by keeping it small we can keep the moment to ourselves and those closest to us. We also have a no cell phone policy at the church, just so it doesn’t become a public affair. I think we have lived so much of our lives in the public eye, especially Caroline who grew up in front of all of you, that now it is time for us to take a step back and keep something special for ourselves. FSO: Are you taking a honeymoon trip immediately after the wedding or waiting? GH: We are honeymooning, but not until the season is over for our skaters. It isn’t fair to them for us to take off for a week or two at the most important part of their year. As of right now, we are planning on visiting one place we haven’t been and one place that is one of our favorites to revisit! FSO: What’s your latest pet update? GH: Currently we have one dog and two cats. Kingston (rescue dog) has been my faithful companion for nearly eight years now and he’s so awesome. He’s been great too because he’s taken very well to the kittens. Qiu Qiu is almost one and a half and he’s the most mellow, calm cat I’ve ever met. I don’t really know how to describe it other than, I don’t think he knows he’s a cat. He and Kingston are buddies and I think because we got him so young and he was never around other cats, he sort of grew up thinking he was a dog. He has separation issues and cries if he can’t find Caroline or me, even if he just walks downstairs, turns around and we aren’t behind him. He loves being held, doesn’t mind if you touch his tail or feet, sits when it’s time to eat and comes when he’s called. Again, I think Kingston did a really good job raising him! Grant with his cats, Daisy (top) and Qiu Qiu. Daisy is Qiu Qiu’s biological sister for another litter. She is about four months old and we also got her at five weeks. She came with siblings, unlike Qiu Qiu, but we knew we couldn’t handle more, so we found homes for the others. She is definitely more rambunctious and adventurous than Qiu and I think it comes from having siblings for the first month of her life. She is sweet, but naughty. I’m very fortunate with my three pets because they all get along and love Caroline and me so much. We also took on the challenge of taking in our cats’ mom, who is an outdoor cat that we’ve been taking care of for the last two years. After the third litter of cats in one year, we were able to finally find someone to come trap and fix her. We picked her up from the vet and were told to release her the next morning, but…. you know we have a soft spot for strays, so she has been living in our first floor guest bedroom for the last almost three months. Unfortunately, she has an eye condition, so she has to be kept separate from the other cats. Kingston can see her and she’s okay with him, but definitely more aggressive, just from being outside for so long. We went through a good period where she let me pet her a little, but that only lasted about three weeks and now she is no longer giving me permission which makes me sad. I was actually sitting downstairs with her while I wrote this, so she has a bit of human company every day. So yeah, that’s my pet update, which of course is probably the longest of all of my responses! FSO: You answered this question before at the beginning of the 2017-18 season – “How would you like to be remembered within the sport?” You replied at the time as follows: This is a good question. I actually don’t know. I don’t think I want to be remembered as somebody who won a bunch of competitions or landed the most quads. I want to be somebody that people remember who was nice and really put his heart into his skating. Sometimes the skating world can be so cutthroat and it really doesn’t need to be. FSO: How would you answer this question today? 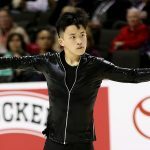 GH: I don’t know if I became the type of skater who will have a “legacy” in skating, but for myself, I want to be remembered as someone who cared. I cared about skating as a sport and as an art. I put my heart and soul into what I did. It wasn’t about the medals for me. Yes, they were nice and they were a great physical representation of my hard work, but the experiences I had mean so much more. I want people to have felt something from my skating. Maybe it was just for a moment, but I want people to feel emotion from the way I skated. In twenty years I won’t be able to do a triple Axel anymore, or even five years for that matter, when I’m tired and chasing around babies, but I will be able to put on a piece of music and experience passion and emotion, so for me, to be remembered for that would be so much greater than medals or anything else. 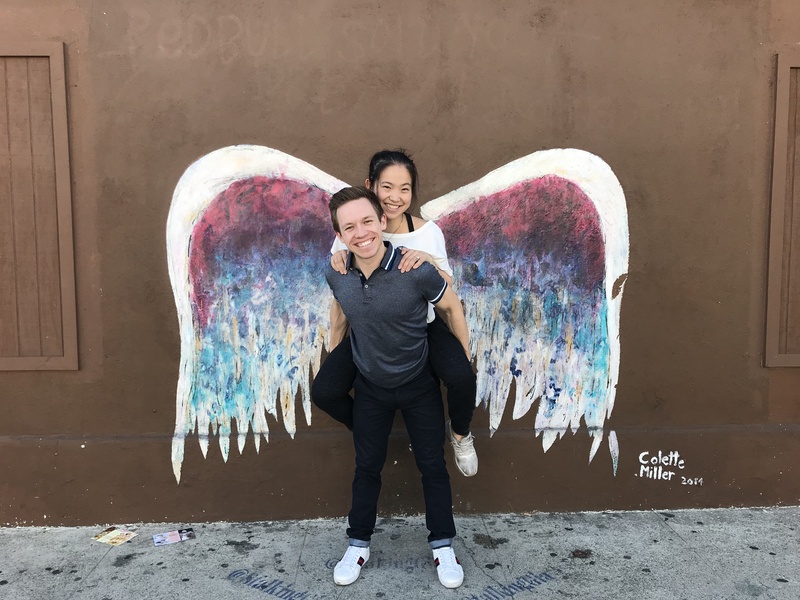 Everyone at Figure Skaters Online would like to thank you wholeheartedly, Grant, for always being generous with your time and willing to share glimpses and insights into your life as a dedicated skater throughout your long and commendable career. We wish for you and Caroline a most wonderful, beautiful wedding and a happy, fulfilling life together, both on and off the ice!